❶What was its value prior to the internet? Identify and define all parts of a standard newspaper. Write content for each part of a standard newspaper. C Pose and respond to specific questions by making comments that contribute to the discussion and elaborate on the remarks of others. Materials A variety of standard newspapers Highlighters Paper Possibly a computer program that can format newspapers Instructions This lesson will begin with an inquiry into standard newspapers. To start, provide each student with a newspaper, a highlighter, and a piece of paper to take notes. Task them with finding distinctive parts of their newspaper. When a student identifies a new part or section , have them highlight it in some way, then jot down some notes of what makes this part different from the others. They will use their notes during the discussion portion of the lesson. When students have had sufficient time to go through their newspaper, bring them together for a whole group discussion. In this discussion, have students provide the name of each section they have identified, along with a description of each. Write section titles and definitions on the board. Be sure to steer the conversation so that it covers at least the following common sections: News section Entertainment section Opinion section Sport section Classifieds section After the discussion, have each student write a definition for each part, then discuss these definitions and write class-consensus definitions on the board. Try it risk-free No obligation, cancel anytime. Want to learn more? Select a subject to preview related courses: Publishing a Class Newspaper Activity Now that students have a firm understanding of each part of a common newspaper, they will create their own paper. This can be approached in a number of ways, so be sure to consider your students' needs while planning. Have the class nominate an Editor-in-Chief to direct the newspaper planning and writing phases. The Editor-in-Chief will be responsible for overseeing the entire process. They will devise a way to section off the rest of the class to cover each of the identified parts of a newspaper. Give students plenty of time to write their section. Be sure to inform them that they can make their writing nonfictional if they wish, but that stories of fiction are more than acceptable for this exercise. When groups are finished with their section, have the Editor-in-Chief decide with input from the class how best to organize and publish the paper. Provide them with available resources to make this phase more straightforward. Discuss the entire process with the class, including any challenges that are inherent for each part of a newspaper. Establish a Real Class Newspaper If students wish to do so, you can have them establish a real class newspaper to be distributed to other classes and to parents. Register to view this lesson Are you a student or a teacher? I am a student I am a teacher. Unlock Your Education See for yourself why 30 million people use Study. Become a Member Already a member? What teachers are saying about Study. Earning College Credit Did you know… We have over college courses that prepare you to earn credit by exam that is accepted by over 1, colleges and universities. You are viewing lesson Lesson 5 in chapter 5 of the course:. Types of Writing Lesson Forms of Creative Writing Lesson Browse by Lessons Anticlimax in Literature: Tutoring Solution American Novels for 9th Grade: Tutoring Solution Ancient Literature for 9th Grade: Pair students, and have each student interview his or her partner and record the responses. Then have each student use the interview responses to write a "dictionary definition" of his or her partner to include in a Student Dictionary. You might model this activity by creating a sample dictionary definition about yourself. Born in Riverside, California. No brothers or sisters. Have students bring in small pictures of themselves to paste next to their entries in the Student Dictionary. Bind the definitions into a book, and display it at back-to-school night. Ask each student to write a brief description of his or her physical characteristics on one index card and his or her name on the other. Give students ten minutes to search for the person who fits the description on the card they hold. There is no talking during this activity, but students can walk around the room. At the end of the activity, tell students to write on the card the name of the student who best matches the description. Then have students share their results. How many students guessed correctly? Patricia McHugh, John W. Set up a circle of chairs with one less chair than the number of students in the class. Instead, someone must make room for that person. Then remove another seat and start the music again. The kids end up on one another's laps and sharing chairs! You can play this game outside, and you can end it whenever you wish. Afterward, stress the teamwork and cooperation the game took, and how students needed to accept one another to be successful. Reinforce that idea by repeating this game throughout the year. Danielle Weston, Willard School, Sanford, Maine Hands-On Activity Have students begin this activity by listing at least 25 words that describe them and the things they like. Provide students a variety of different colored pencils or markers to use as they write. Then invite students to share their work with the class. They might cut out the hand outlines and mount them on construction paper so you can display the hands for open house. Challenge each parent to identify his or her child's hand. Then provide each student with five different-colored paper strips. Have each student write a different talent on separate paper strips, then create a mini paper chain with the strips by linking the five talents together. Post the silhouettes to create a sense of "our homeroom. You can use such cards to gather other information too, such as school schedule, why the student signed up for the class, whether the student has a part-time job, and whether he or she has access to the Internet at home. 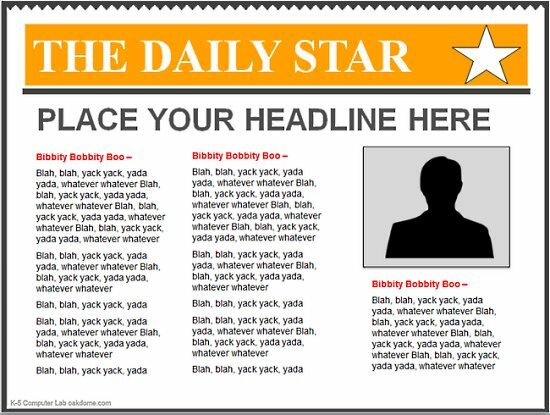 As a final bit of information, ask the student to write a headline that best describes him or her! This headline might be a quote, a familiar expression, or anything else. When students finish filling out the cards, give a little quiz. Then read aloud the headlines one at a time. Ask students to write the name of the person they think each headline best describes. Who got the highest score? It seems as if parents are contacted only if there is a problem with students. At the end of each grading period, use the home address information to send a postcard to a handful of parents to inform them about how well their child is doing. This might take a little time, but it is greatly appreciated! Pop Quiz Ahead of time, write a series of getting-to-know-you questions on slips of paper -- one question to a slip. Blow up the balloons. Give each student a balloon, and let students take turns popping their balloons and answering the questions inside. Contributor Unknown Fact or Fib? This is a good activity for determining your students' note-taking abilities. Tell students that you are going to share some information about yourself. They'll learn about some of your background, hobbies, and interests from the second oral "biography" that you will present. Suggest that students take notes; as you speak, they should record what they think are the most important facts you share. When you finish your presentation, tell students that you are going to tell five things about yourself. Four of your statements should tell things that are true and that were part of your presentation; one of the five statements is a total fib. This activity is most fun if some of the true facts are some of the most surprising things about you and if the "fib" sounds like something that could very well be true. Tell students they may refer to their notes to tell which statement is the fib. Next, invite each student to create a biography and a list of five statements -- four facts and one fib -- about himself or herself. Then provide each student a chance to present the second oral biography and to test the others' note-taking abilities by presenting his or her own "fact or fib quiz. Mitzi Geffen Circular Fact or Fib? Here's a variation on the previous activity: Organize students into two groups of equal size. One group forms a circle equally spaced around the perimeter of the classroom. There will be quite a bit of space between students. The other group of students forms a circle inside the first circle; each student faces one of the students in the first group. Give the facing pairs of students two minutes to share their second oral "biographies. After each pair completes the activity, the students on the inside circle move clockwise to face the next student in the outer circle. Students in the outer circle remain stationary throughout the activity. When all students have had an opportunity to share their biographies with one another, ask students to take turns each sharing facts and fibs with the class. Then pass each student a sheet of nice stationery. Have the students write return letters to you. In this letter, they will need to answer some of your questions and tell you about themselves. This is a great way to get to know each other in a personal way! Mail the letter to students before school starts, and enclose a sheet of stationery for kids to write you back. You might extend the activity by having each student introduce his or her partner to the class. Give each student a slip of paper with the name of an animal on it. Then give students instructions for the activity: They must locate the other members of their animal group by imitating that animal's sound only. No talking is allowed. The students might hesitate initially, but that hesitation soon gives way to a cacophony of sound as the kids moo, snort, and giggle their way into groups. The end result is that students have found their way into their homerooms or advisory groups for the school year, and the initial barriers to good teamwork have already been broken. Hold a large ball of yarn. Start by telling the students something about yourself. Then roll the ball of yarn to a student without letting go of the end of the yarn. The student who gets the ball of yarn tells his or her name and something good about himself or herself. Then the student rolls the yarn to somebody else, holding on to the strand of yarn. Soon students have created a giant web. After everyone has spoken, you and all the students stand up, continuing to hold the yarn. Start a discussion of how this activity relates to the idea of teamwork -- for example, the students need to work together and not let others down. To drive home your point about teamwork, have one student drop his or her strand of yarn; that will demonstrate to students how the web weakens if the class isn't working together. Questions might include the following: What is your name? Where were you born? How many brothers or sisters do you have? What are their names? Do you have any pets? Tell students to write those questions on a piece of paper and to add to that paper five more questions they could ask someone they don't know. Pair students, and have each student interview his or her partner and record the responses. Then have each student use the interview responses to write a "dictionary definition" of his or her partner to include in a Student Dictionary. You might model this activity by creating a sample dictionary definition about yourself. Born in Riverside, California. No brothers or sisters. Have students bring in small pictures of themselves to paste next to their entries in the Student Dictionary. Bind the definitions into a book, and display it at back-to-school night. Ask each student to write a brief description of his or her physical characteristics on one index card and his or her name on the other. Physical characteristics usually do not include clothing, but if you teach the primary grades, you might allow students to include clothing in their descriptions. Put all the physical characteristic index cards in a shoe box, mix them up, and distribute one card to each student, making sure that no student gets his or her own card. Give students ten minutes to search for the person who fits the description on the card they hold. There is no talking during this activity, but students can walk around the room. At the end of the activity, tell students to write on the card the name of the student who best matches the description. Then have students share their results. How many students guessed correctly? Patricia McHugh, John W. Set up a circle of chairs with one less chair than the number of students in the class. Play music as the students circle around the chairs. When the music stops, the students must sit in a seat. Unlike the traditional game, the person without a seat is not out. Instead, someone must make room for that person. Then remove another seat and start the music again. The kids end up on one another's laps and sharing chairs! You can play this game outside, and you can end it whenever you wish. Afterward, stress the teamwork and cooperation the game took, and how students needed to accept one another to be successful. Reinforce that idea by repeating this game throughout the year. Danielle Weston, Willard School, Sanford, Maine Hands-On Activity Have students begin this activity by listing at least 25 words that describe them and the things they like. No sentences allowed, just words! Then ask each student to use a dark pen to trace the pattern of his or her hand with the fingers spread apart. Provide another sheet of paper that the student can place on top of the tracing. Because the tracing was done with a dark pen, the outline should be visible on the sheet below. Direct students to use the outlines as guides and to write their words around it. Provide students a variety of different colored pencils or markers to use as they write. Then invite students to share their work with the class. They might cut out the hand outlines and mount them on construction paper so you can display the hands for open house. Challenge each parent to identify his or her child's hand. Then provide each student with five different-colored paper strips. Have each student write a different talent on separate paper strips, then create a mini paper chain with the strips by linking the five talents together. As students complete their mini chains, use extra strips of paper to link the mini chains together to create one long class chain. Have students stand and hold the growing chain as you link the pieces together.